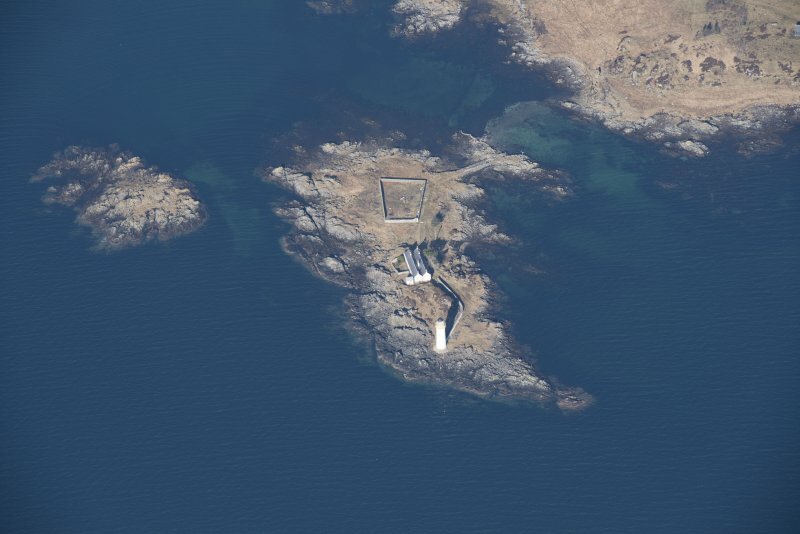 Oblique aerial view of Oronsay Lighthouse, looking WNW. 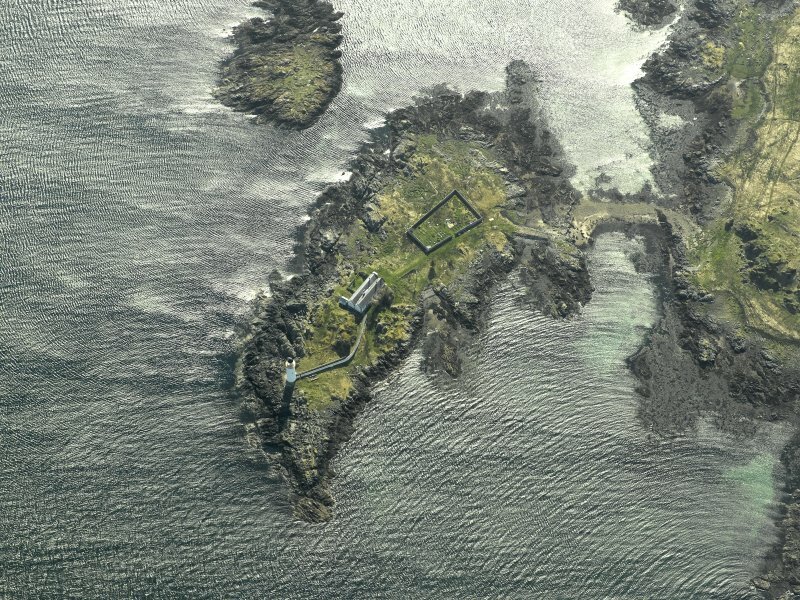 Oblique aerial view centred on Oronsay Lighthouse, Skye with adjacent cottages, taken from the NE. 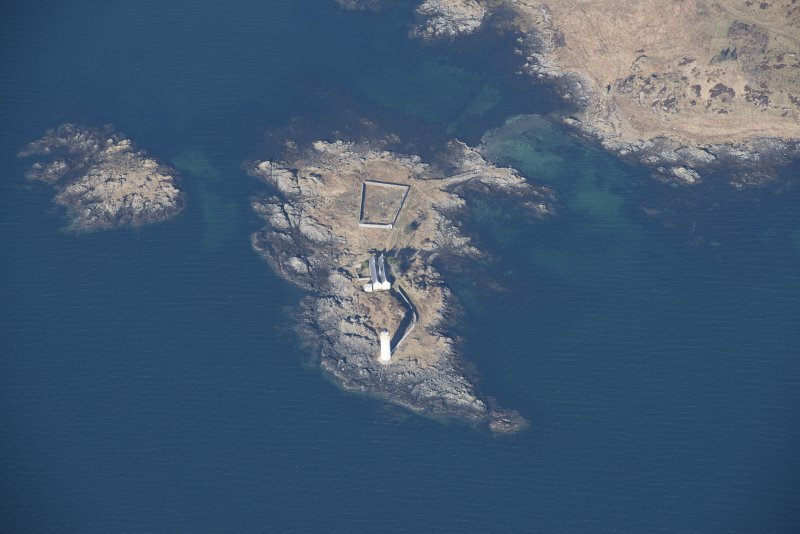 Oblique aerial view centred on Oronsay Lighthouse, Skye with the adjacent cottages, taken from the E.
Oblique aerial view of Oronsay Lighthouse, looking W.
Isle Ornsay Lighthouse D. & T. Stevenson, 1857 A balconied tower standing out like a white finger against the awesome backdrop of the Garbh Criochan, with double range of keepers' cottages hugging the ground above a stone-walled garden close by. Like their twins on Eilean Ban, these stand back to back and were formerly owned by Gavin Maxwell who, finding them '… primordial, without a stick of furniture, and no light or fuel ... eerie beyond belief', converted them a few years after the lighthouse was automated in 1962, into 'a single sumptuous 4-bedroomed residence . '(for a fuller description see p.21 0). Weather and wild seas soon got the better of this romantic dream and neglect took its toll; the holiday house they provide today is somewhat more basic. (Location cited as NG 713 122). Ornsay Lighthouse, Eilean Sionnaich: built 1857 by engineers D and T Stevenson. A short, circular-section tower with corbelled balcony. The single-storey keepers' houses have ridged roofs. 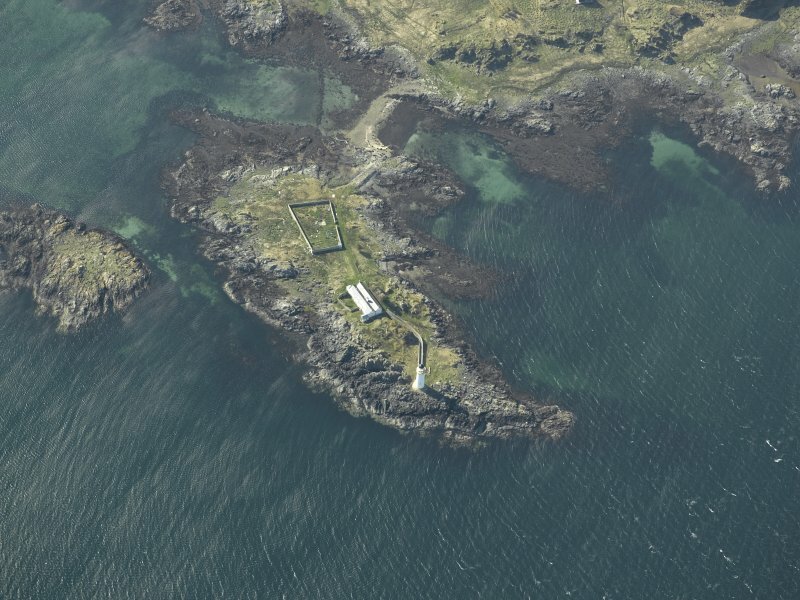 Ornsay light was built by David Stevenson to guard the S approach to the Sound of Sleat, and first lit on 10 November 1857; it used Thomas Stevenson's 'condensing' apparatus to display different strangths of light in different directions. It was converted to gas operation in 1898 and automated in 1962. 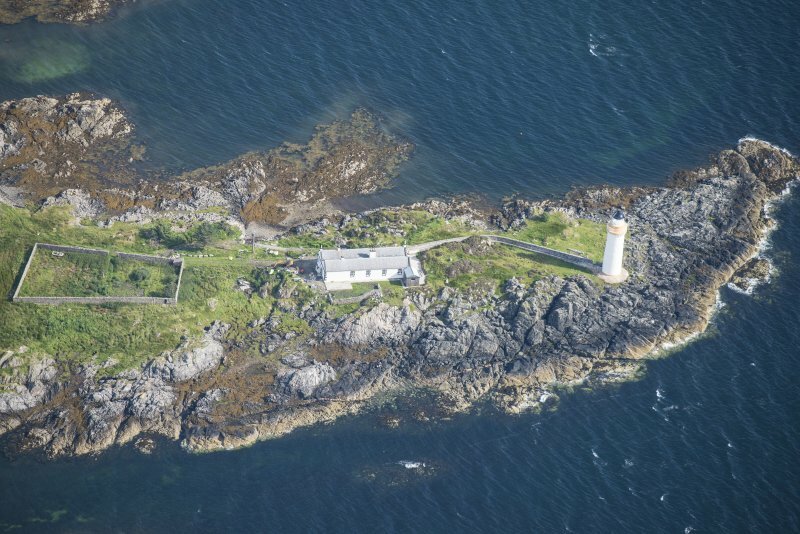 This rock lighthouse is sitauted on the island of Eilean Sionnaich, just off the SE coast of Skye, and on the W side of the Sound of Sleat and near the S entrance to Kyle Rhea. Information from RCAHMS (RJCM), 17 August 2005. 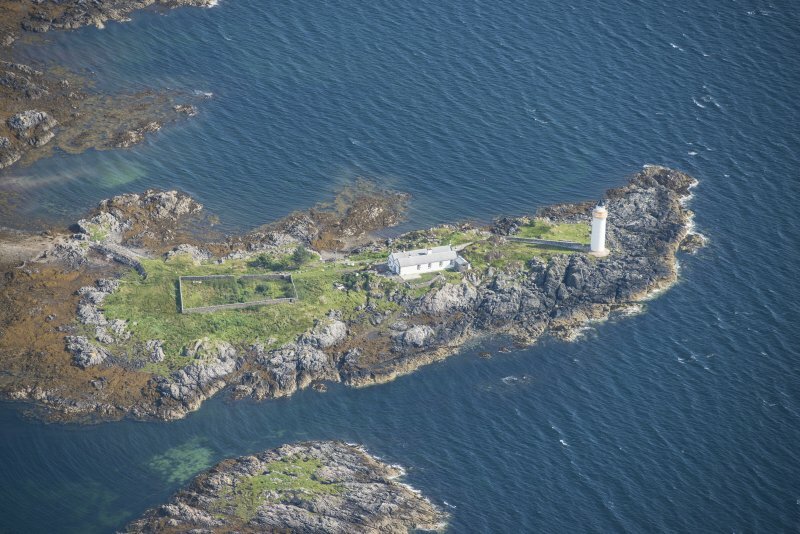 Ornsay light was built by David Stevenson to guard the S approach to the Sound of Sleat, and first lit on 10 November 1857; it used Thomas Stevenson's 'condensing' apparatus to display different strangths of light in different directions.